Heavenly Hash Truffle Bars are loaded with coconut, pecans, marshmallows and chocolate and topped with a decadent ganache. This incredibly easy treat comes together in minutes and is sure to impress the chocolate lover in your life! Line a 9x13 baking dish with parchment paper and set aside. In a large microwave-safe bowl, combine the semi-sweet chocolate chips and sweetened condensed milk. Microwave on high heat in 30 second intervals, stirring in between, until chocolate is melted and mixture is smooth. Stir in marshmallows, pecans, and coconut. Spread mixture into prepared baking dish. Top with another cup of miniature marshmallows and press down gently. Place bittersweet chocolate in a heat-proof bowl. 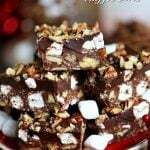 Pour mixture over the top of the chilled bars and use an offset spatula to spread over the top of the marshmallows. Sprinkle the chopped pecans over the top and chill again until set.